Hello... my name is Amanda... and I'm addicted to Mustangs. Well, now that's out of the way, let me explain my passion to you. I have loved horses my entire life. I started taking lessons as a young child. Got my first horse for my 13th birthday. At the age of 15 I was paid to saddle train my first horse. It was a little red Mustang mare. Not long after that, was hired to train a 5 year old Calico Mtns NV Mustang mare. She challenged me on every front. She was afraid of people, liked to bolt in fear, and was even more afraid of a saddle. In 30 days, I called her owner out, and they went on their first trail ride. The owner was in tears as she hugged me and thanked me for getting through to her mare. I fell in love with that mare, and how smart and willing she was, and how she gave up her fear once I gained her trust. That was it... I had to have my own. So in the year 2000, I drove 7 hours to go to my first adoption and bring one home. Over the years, I've adopted, trained, fostered, volunteered, became a TIP trainer for a while, competed in two Extreme Mustang Makeovers, and have been spreading information to people that didn't even know America still had wild horses. I feel that since I can't adopt them all, the next best thing I can do is share them to people that might not have known, and find them homes! Nothing is more gorgeous than seeing Mustangs wild and free out on the range. The wind blowing their tangled manes... foals napping in the sunlight. It's a heartwarming picture of part of America's Heritage. But the life of a wild horse isn't all sunshine and rainbows. Harsh winters, drought, extreme heat, and severe winters all take their toll on the herds. Plus the fact that many natural predators have been removed. Horses continue to breed unchecked, and their numbers multiply quickly. So this is where the BLM comes in. 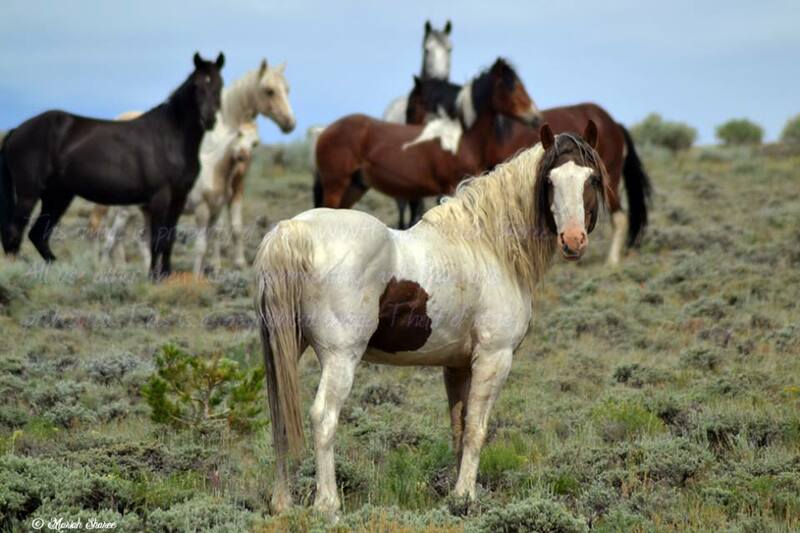 If there were no management of the wild horses, ranges would be destroyed, there would be no feed for them, and they would suffer and slowly starve to death out on the range. BLM rounds up excess horses off the range and offers them for adoption. While it might seem sad to see these horses standing in holding pens, it's the only way to keep the good health of both the horses and the range land. While they are in holding, they are branded, vaccinated, wormed, well fed, given any medical care they might need, and offered for adoption. These horses are smart, sturdy, and incredibly willing partners with the right training. Right now there are more wild horses standing in holding pens than out in the wild. There are over 2500 animals at Canon City alone. The best way to get them out of holding pens is to find adopters and get them in new homes! Again- I am a VOLUNTEER. I donate my time to sharing these living legends, my gas to drive down the facility, and countless hours sharing these beauties online and answering questions. I spend mere minutes evaluating each horse, so sometimes my statements about temperament or height may not be perfect. And I support the BLM and the staff at Canon City 100%. They are amazing and caring people who only want the best for these horses. While I am only one person, and can't make a huge difference, I can surely make a difference to the horses and people I bring together by spreading information! And it is worth every second.